Traditionall a Kelvin scale rating is used by aquarists as a guide to assist with choosing the correct lighting that your aquariums inhabitants would enjoy in their natural environment on top of aesthetically pleasing lighting for your aquarium to become that centrepiece you desired for it to become as touched upon in the article regarding decorations. 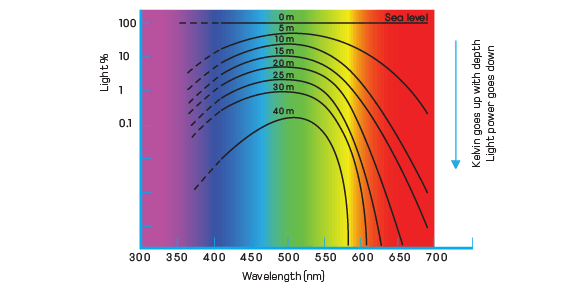 Different biotopes and organisms have varying spectral requirements, and this should be viewed as a separate issue to the quantity of light (or light power). We should look at spectral as a measurement of quality, or fit, for purpose for that specific biotope. As a rule freshwater lamps have lower K (redder) and marine lamps have a higher K (bluer). Imagine a black object being heated up by a light source. It would at first glow a red colour, and then to a varying degree of white, and eventually to a blue colour depending on the shading as shown below. A chart like this is used to identify terrestrial light in the form of a K value, and throughout the day a change in the value of K occurs from sunrise (2500K) to daylight (6500K) and over the course of the day will increase to 10,000K or even higher. Why does K increase when the sky is overcast? The simple answer is when water droplets filter light it filters lower K levels first. Applying this knowledge to an aquatic environment we would use the term K to a plant in a shallow river that received light close to levels at daylight (low to middle K levels) whereas coral reefs in deeper waters would receive a different spectra level even though it is receiving light from the same light source. This is because the red content is filtered out, and continues to be filtered out as light travels further down, with depth as shown below. Despite this nature has evolved different strategies to adapt with different types of chlorophyll that are tuned to the spectra which they would usually receive. By supplying the wrong spectra this could either starve organisms in your aquarium, or encourage nuisance species such as algae. Our device has a small, but developing, database of plants and coral with their light requirements. The purpose of this is to allow the user to best place their coral, or to determine if the right amount of light is being used for their aquarium. Our device calculates K levels of any light source used by pasing 'zyx' colour coordinates of the light it will receive through a set of known equations. The device can measure at a greater distance along the plank line when compared to traditional devices. This is important as the increased usage of LEDs has meant that light sources can in fact have high levels of blue and violet which will increase rapidly the figure of K.
K is a useful tool but as experienced aquarists use mixed light sources, or tubes with different phosphor in the combined light, it is often difficult to understand and it will change throughout the aquarium due to shadow or depth. This is why the Seneye is submersible and allows the user to move the device to specific parts of the aquarium, to log the information, and to display the light reading. More importantly, and less understood, is how aquarium light output can change over time as from the turning on your device regardless of age the spectral output will change. Often with metal halide blue output will degrade first and K will shift down towards red. Regularly logging K along with power will help you understand the state of your aquariums lighting as time goes on.